Rain continues in the Dominican Republic. Los Robles is still inaccessible. Flash floods came through and destroyed many homes in both Algodon and Los Robles. 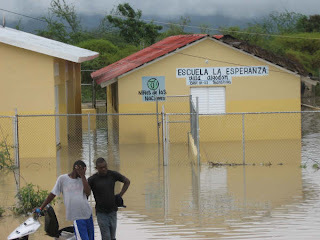 The water in Algodon has gone down a little, though many homes and our schools are still halfway under water. Thankfully all our staff, families, and children are safe. They have been safely evacuated from Algodon and Los Robles and are staying with COTN staff, at our mission house, and at local partnering churches. Damages are being assessed and repair estimates are being calculated. For those of you concerned about your sponsored children, rest assured they are all safe. Praise God!